Pros Separates itself from the rest of the pack in terms of comfort due to its super-soft Egyptian cotton construction. Cons Relatively high-priced, but you are paying for comfort and longevity. Summary Although it costs a bit more than other models, its performance and allergy-friendly construction makes it an unbeatable investment. Pros An essential for allergy sufferers due to its fully hypoallergenic down alternative, which also promotes comfort and warmth. Cons Extremely expensive - to the point where the additional cost is not worth the extra value. Summary An extremely high quality comforter, but we recommend the Royal Hotel which is much more affordable and is on par in terms of quality. Pros Its 300 thread count construction makes it very soft and comfortable. Cons Frequent complaints of excessive fiber shedding, particularly right after unpacking the comforter. 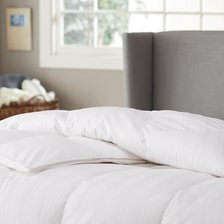 Summary Although it does a good job of promoting warmth and comfort in colder temperatures, other comforters offer similar performance at a lower price. 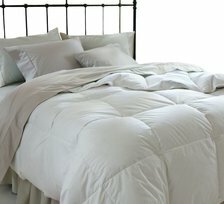 Pros Features a unique box stitch design which keeps the comforter from shifting over time. Made with a fully hypo-allergenic material. Cons Lacks the thread count of higher-priced comforters. Summary You won't find a better performing comforter at such a reasonable price. Definitely the best value for your money. Pros Stands out for its ultra-soft material and warmth similar to goose down without the associated allergens. Cons Despite its all-season designation, this comforter is too heavy for warmer weather. Summary It's hard to top this comforter if you're looking for an allergy-friendly option for all seasons.